Our recent urban beekeeping survey and tour revealed that the majority of Philly’s two dozen or so beekeepers started within the last five years. Why? We know that bees are essential pollinators for gardens, farms and orchards. Other than wind-pollinated corn, the vast majority of our vegetable, fruit and nut crops are highly dependent on bees for pollination. Commercial beekeepers rent out their hives all across the country, moving as the harvesting season changes. In recent years, these “rental” hives have been devastated by Colony Collapse Disorder (CCD), a phenomenon in which a hive’s worker bees suddenly disappear en masse. No one knows for sure what causes it, but home scale beekeepers have been almost entirely unaffected and there have been no reports of CCD within the Philadelphia beekeeping community. That seems to point to a correlation between the stresses of commercial beekeeping and CCD (kind of like the problems associated with factory farming). Considering the vital role bees play in pollination, relocalization of beekeeping may be vital to the future of our food production. In many ways, honeybees are the perfect urban livestock. They can be kept in small spaces—even on rooftops. They are quiet and unaggressive (most “bee” stings are actually perpetrated by bumblebees and hornets). They require relatively minimal time and financial investment: an average of four hours a month and a few hundred dollars to get started. Above all, they produce wonderful, abundant honey, which is a much healthier sweetener than the highly refined sugar products now ubiquitous in processed food and on grocery store shelves. Eating unfiltered, raw honey from your immediate locale is also widely thought to help with seasonal allergies. Furthermore, when stored in airtight containers, honey has a shelf life of a few thousand years. Beekeepers at Mill Creek and Greensgrow Farms will tell you that their homegrown honey often sells out within weeks of harvesting. With the adaptability of beekeeping, Philadelphia could easily fulfill all of its own demand for honey. Honeybees provide other useful products as well. The wax used for comb construction can be harvested along with the honey and has countless uses ranging from candlemaking and cosmetics to batik and moustache wax. After the honey is harvested from the comb, it can be placed in a nylon stocking or fine mesh bag and boiled very briefly to remove impurities, such as dirt and larval casings. The impurities remain in the stocking, which can then be removed, and the wax solidifies on top of the water as it cools. The wax can be melted again and poured into molds to make candles, or combined with other ingredients to make soap. Having a surplus of honey around can also provide an easy avenue into the art of home brewing; mead, wine made from honey, is a very simple and delicious alcoholic beverage easily tackled by folks new to the craft. Propolis, an anti-microbial substance the bees use to seal and sterilize their hives, has a long history of being used medicinally in the treatment of colds, sore throats, aching teeth and the flu. Location, location, location. You can keep bees in your backyard or on your rooftop, and at community gardens, urban farms, public gardens and schools. Nothing beats learning from someone experienced. If you don’t happen to know any beekeepers, you can connect by taking classes or attending meetings of Beekeeping Associations. Neighboring Montgomery County (montcobeekeepers.org) and Chester County (chescobees.org) both have established groups. PASA is hosting a class, “A Taste of the Extracting and Bottling Process for a Small Honey Business,” on Tuesday, August 11 from 1 p.m. to 4 p.m. at Greenstone Gardens and Apiary in Malvern, PA. For more information, go to pasafarming.org. Also, a Southeastern Pennsylvania Honey Bee Symposium is being held November 10 at the Temple Ambler Campus. Visit the Montgomery County site for more information. Acquire equipment, supplies and bees. All of this can be mail-ordered from vendors like the Walter T. Kelley Company (kelleybees.com) or acquired from local beekeeping groups for around $250. Assembling your hive will take several days of work. Alternatively, a more rustic top bar hive (an older form still commonly used in the tropics) can be built for as little as $7. A starter colony of bees, including a queen, will cost about $100. Adequate room for the rearing of brood and the storage of food (nectar, pollen, honey) as the season progresses and the hive increases in size. Add frames and hive bodies as necessary. Enough nectar and pollen coming into the hive throughout the season and going into winter. It is sometimes necessary to supplement their food supply with sugar. Health of the laying queen and signs of hive diseases or pests that may require intervention on the part of the beekeeper. Signs that the hive may be preparing to swarm. Bees instinctively like to swarm—it’s how they perpetuate the species. If not preempted by the keeper, a large number of bees will leave with the queen to start a new hive. A hive inspection typically takes 15-30 minutes and should be conducted weekly during the spring when risk of swarming is highest. This is of particular importance in the city. As much as everyone loves bees (even if they don’t know it yet), having a swarm of thousands hanging from a telephone pole in front of your house might make some people a bit nervous. As the season progresses, inspections need not happen as frequently. Extract your honey and beeswax. The simplest method of harvesting honey from the hive is to cut out sections of comb and eat it! If you want liquid honey, you can cut out the comb, crush it and strain it to separate the wax from the honey. The most common means of harvesting honey, both commercially and by hobbyist beekeepers, is an electric or hand crank extractor. Cut a thin layer of beeswax cappings from the surface of a full frame, then place multiple frames in the extractor, and spin rapidly to remove the honey. This method will allow you to harvest honey without crushing the comb, which can be made into other products or returned to the hive for reuse by the bees. Extraction is often done twice a year and typically involves a full day’s work. 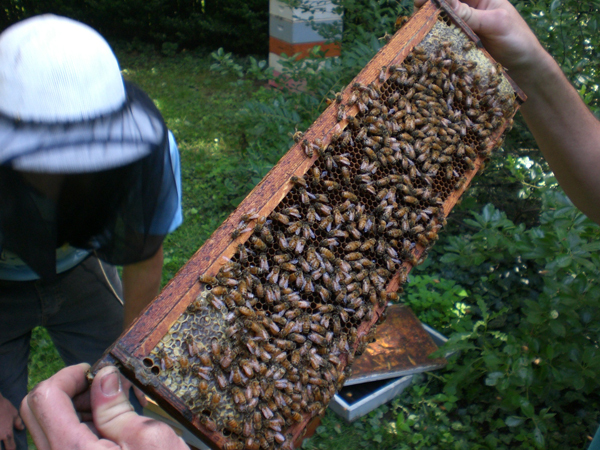 An extractor costs between $350 and $800, but can often be shared or borrowed from beekeeping groups. Recommended reading: The Backyard Beekeeper, Kim Flottum and Natural Beekeeping, Ross Conrad.